The Aflatoxin Proficiency Testing and Control in Africa (APTECA) program hosted by the mycotoxin diagnostics platform at the Biosciences eastern and central Africa-International Livestock Research Institute (BecA-ILRI) Hub is contributing to the availability of safe maize on the African market. The program, managed by the Texas A&M University, USA, was initiated to support the commercial maize milling sector in Kenya through a public-private partnership. Cereal millers which participate in the voluntary program manage aflatoxin risk by improving their quality systems to accurately perform their own tests for aflatoxins in maize flour. 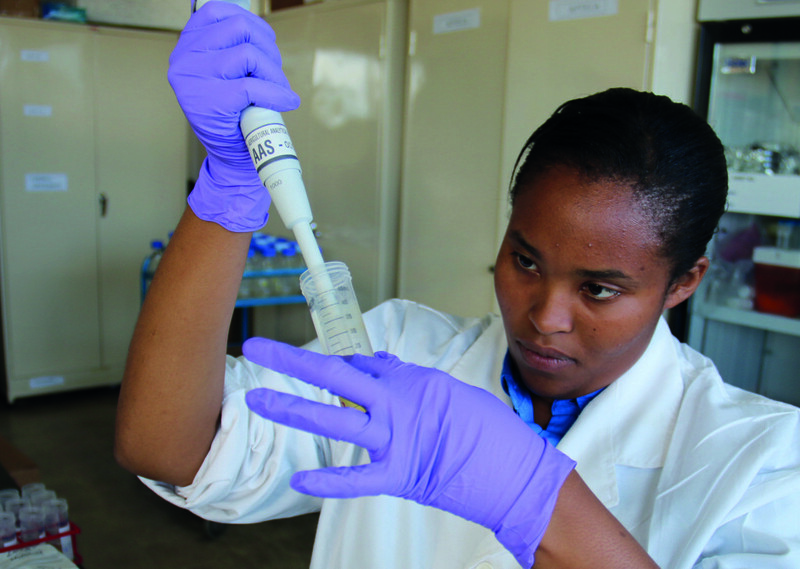 Participation in the APTECA program improves testing accuracy through qualification of the mill’s laboratory analysts; use of working controls with a known level of aflatoxin; routine proficiency testing; and verification of mill results by the ISO accredited Texas A&M AgriLife laboratory housed at the BecA-ILRI Hub. In 2015, 31 laboratory analysts from commercial mills across Kenya attended training and qualified to analyse maize flour using validated aflatoxin testing platforms. These qualified individuals analyse working control samples twice a week at their respective mills to ensure testing accuracy and results are evaluated using a statistical process control charting technique. Further verification of mills’ aflatoxin test results of finished product occurs at the Texas A&M AgriLife laboratory at the BecA-ILRI Hub and results are sent to the APTECA mills to assist in quality improvement and aflatoxin risk management. Already, APTECA has hosted five proficiency testing exercises involving 30 industry and public sector laboratories. The companies involved in the project include Osho Grain Millers; Unga Holdings; Alpha Mills; Capwell Industries; Kabansora Millers; Kenblest Group; Maisha Flour Mills; Mombasa Maize Millers; Pembe Flour Mills; Premier Group; and United Millers all from Kenya. The APTECA research is part of an effort to explore co-regulation of aflatoxin as a regulatory risk-management policy alternative with the aim of improving food safety and facilitating trade in Africa. Co-regulation involves a government-private sector partnership in regulation that includes statutory or government-backed codes of practice combined with regulatory and industry oversight. A marketing study conducted by the International Food Policy Research Institute (IFPRI) and the Western Michigan University in collaboration with Texas A&M AgriLife explored the impact on sales of marketing products branded with a logo on packages of maize meal stating ‘Aflatoxin Tested Process Verified by APTECA.’ This logo conforms to the East African Community labelling requirements and AgriLife has received trademark approval for it from the Kenya Intellectual Property Institute. A memorandum of understanding (MoU) with a Kenya regulatory authority, accreditation of the AgriLife laboratory activities by the Kenya Accreditation Service, and training regulatory chemists from six countries and nine agencies has helped lay the groundwork for a regional public-private sector partnership to manage aflatoxin risk and facilitate trade among countries in the Common Market for Eastern and Southern Africa.